Superfan are now widely preferred in Offices, Hospitals, Hotels, Restaurants, Schools and college class rooms as it is energy efficient, easy to use, low noise and comes in a range of fun colours to complement and enhance the air flow compared to other normal fans. Super A1's leaves are inspired by the petals of flowers. Its wide leaves deliver abundant air even at low speeds and it runs quieter. 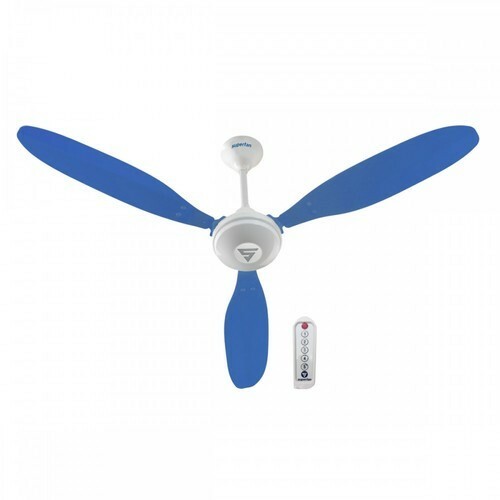 It is the perfect ceiling fan for places where quietness is appreciated - classrooms, libraries, offices, hospitals, bedrooms etc. It comes with a 9-key remote that has 6 keys for controlling the speed of Superfan and two keys for fine control of speed, and a pattern key for simulating natural breeze. Our organization, Pigeon Agency is known for trading and exporting of electrical parts like lightings, fans, switch gears, motors, wires, and cables. All our products have been framed for their premium quality, durability, and long service life. They also offer great performance and efficiency. This, we believe, is due to the top brand vendors we liaise with. ABB, Bajaj, Wipro, Crompton, Havell's, Osram, Philips, and Finolex,C&S, R.R cables, are some of the market leading vendors we procure our range of products from. As a result, our customers are assured of the best in market electrical items from us. The state-of-the-art warehousing and packaging unit that we have in our organization has a great hand in maintaining the quality of our products. In addition, we have tie-ups with reliable C&F agents across the world who help in the transit of our consignments. The great quality of our products, coupled with the after-sales services that we offer have amassed us clients from across the world. Furthermore, our ethical and transparent business policies and dealings have helped us in retaining our clientèle.